I noticed a recent change to Skype, specifically in the chat client. Look at all those smiley faces! At first, I thought, the person that I'm chatting with is really overdoing it on the smileys. I get it, you're being friendly! But it turns out: if you hover over the smiley face, it's a "react to this message" button. Do the Skype product managers really think that "reacting" to a chat message is so common that it needs to have its own icon and menu for every single message? Or maybe this is more useful in a group chat setting? Is Skype trying to compete with Slack and IRC? Either way, I found it very distracting, confusing, and unnecessary. Most of my Skype chat is 1-on-1, and this icon is completely superfluous for that. It is only marginally useful for group chat. I would suggest a single smiley face icon in the "Type a message here" area instead. Skype already has that, but it brings up a completely different menu. Which is also confusing. If there was a way to turn this off, I would use it. 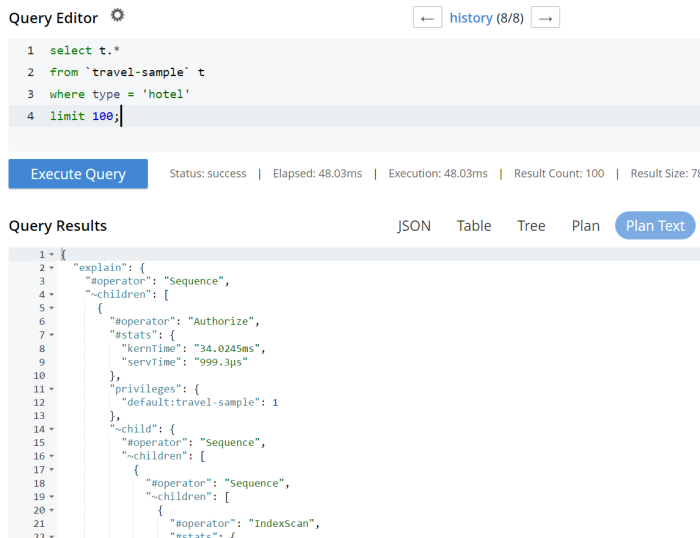 This is a repost that originally appeared on the Couchbase Blog: A tour of the new Couchbase Web Console. Change is coming to the Couchbase Web Console that you know and love. But don’t worry, the old UI will still be available (for a while). In this blog post, I’m going to take you on a tour of the new UI. I’ll be pointing out some of the differences and similarities. If you have anxiety about change, don’t worry: the purpose of this change is to improve usability, performance, and efficiency. The new UI gives Couchbase Web Console room to grow with new features that are coming down the road. This blog and the screenshots in it were taken from an early developer build. There may be other changes and improvements that show up by the time the release is in your hands, so the final product might be different. Feel free to point out any differences in the comments below. The installation and setup process has not changed much, but it does get a fresh coat of paint. The installer itself appears the same (although the setup wizard is likely to be revised in future builds). 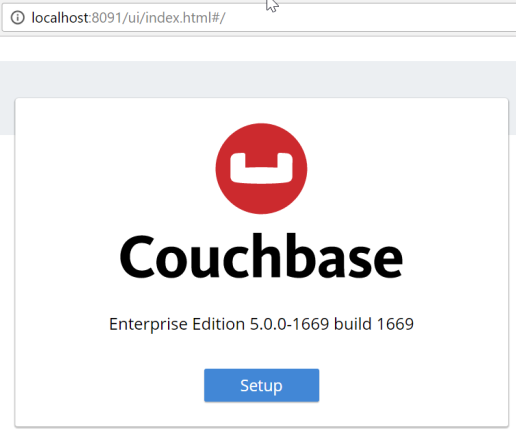 Once the installer is complete, you’ll get redirected to a browser (if you’re installing Couchbase Server locally, this means a browser pointed to http://localhost:8091 will appear). Functionally, this part of the experience is the same as before, but it gets a new coat of paint. After you click the "Setup" button, you’ll be taken through the installation wizard. Depending on which version you have been using, there may be some new options here that you haven’t seen. I’m not going to cover them in this post, but stay tuned for more blog posts about upcoming features in the latest releases. The sample buckets are still available. 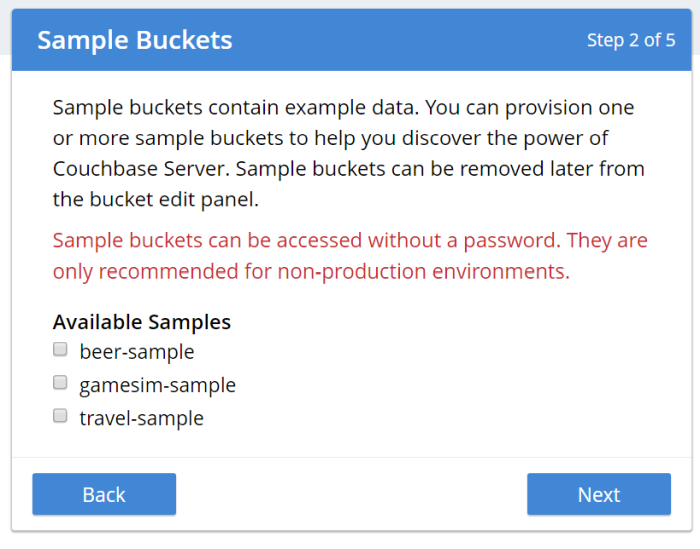 Note that these buckets (as always) are not password protected, and are meant for development only. 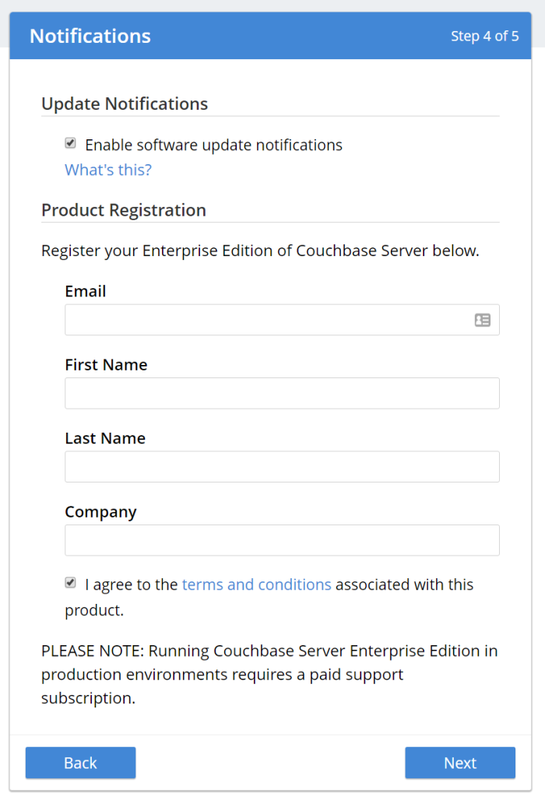 Please check out the recent Advisory Note about Couchbase security. You can also choose to create a bucket named "default" during setup. Again, this is not recommended for production (even if you put a password on it), since it’s a well-known bucket name that makes it a target. It’s also optional, you can click "Skip". Notification and Terms and Conditions are next. 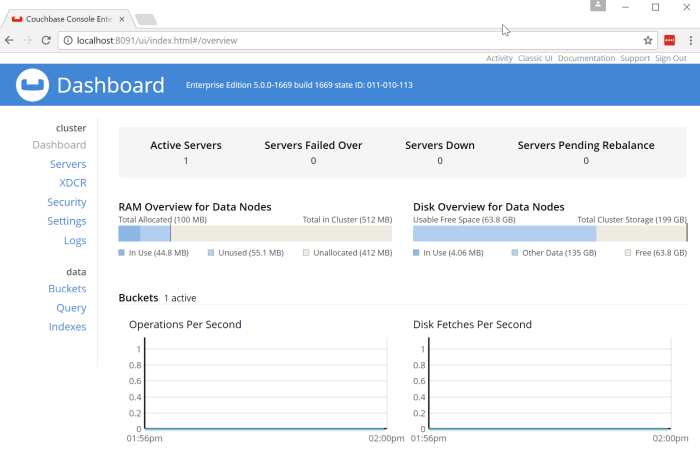 We are offering the full Enterprise edition in the developer build, so you can check out the Enterprise features. Finally, create an admin user. Once again, I recommend not using "Administrator" as the user name in production, as it is a well-known default. Also, make sure to use a strong password. Once you’ve gone through the familiar install process, it’s time to see some of the substantive changes to the UI. The first thing you’ll see is the dashboard screen, which has been streamlined. The design. 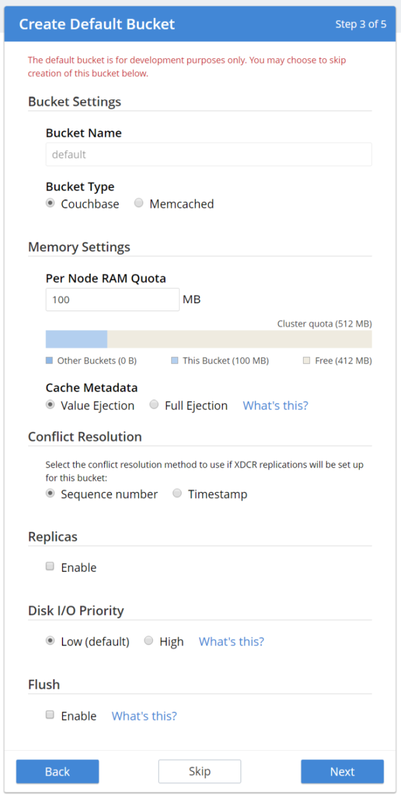 The new Couchbase Server UI is heavily influenced by Google’s Material Design. You will see more evidence of this as you navigate around the site. Material Design is meant to provide a "design language" that is geared toward "digital material" that can expand/change intelligently. Main Navigation. The navigation is now vertical and on the left side of the page. 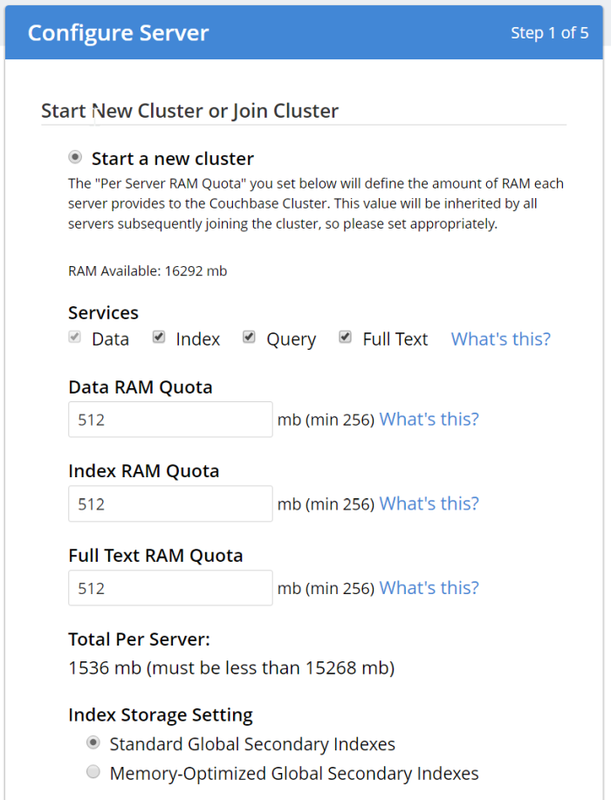 Also notice that is is organized by "cluster" and "data". Click on the "Servers" link to see the new look of the servers page. This should look relatively familiar. 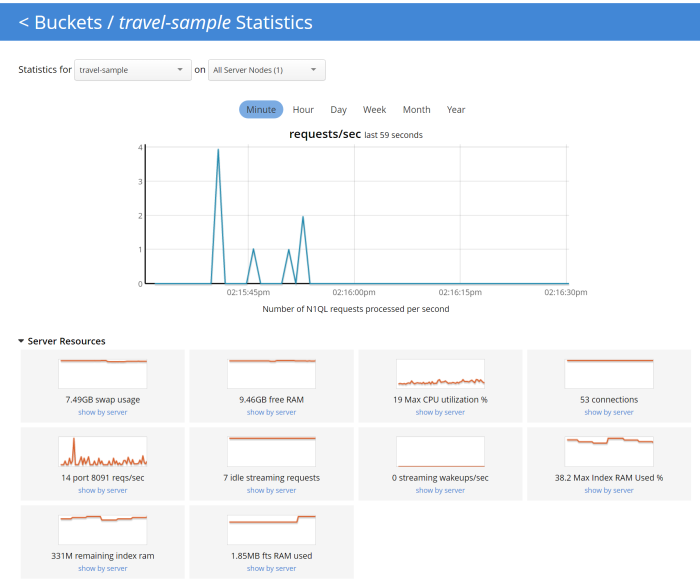 Each node is listed here, with a list of services running on each node and system metrics. I only have one node in my example, but each node would be listed here in a production deployment. Notice that there are filters "Active Server" and "Pending Rebalance" that have a rounded highlight. Next to them are some buttons to manage servers and server groups which use rectangle shapes. These shapes help to provide visual cues no matter what the size of your screen is. Continuing the tour, click on the "Security" navigation link. Not much different on this screen compared to the old UI, but I do want to draw your attention to the sub-navagation at the top: "Internal User/Roles", "Root Certificate", and "Audit". The secondary navigation across the site will be across the top of the page like this. 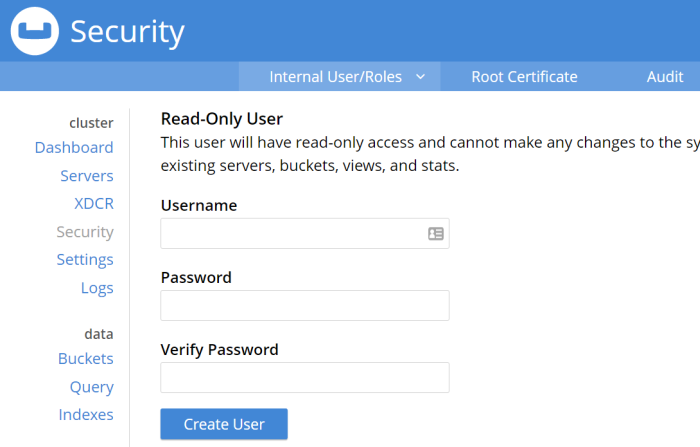 There are some new features coming soon for role-based security. I would expect the UI here to evolve in future versions to accomodate. As a developer, this is always my favorite part of the Couchbase Console, and the one I spend most of my time in. Besides the obvious design change, there are some minor improvements and changes here that I’d like to call attention to. No more Clear button. I use the clear button a lot, but my usage is probably atypical from a typical Couchbase user. The clear button is a frustrating button to hit accidentally while working on queries, so it’s been removed. History. Click on "history" to see a list of all the queries that you’ve run. It’s searchable! Which can be very useful after a long day of query writing and data modeling. Remember that "clear" button? It’s here in the history popup; you can still access it, but you’re less likely to click it by accident. 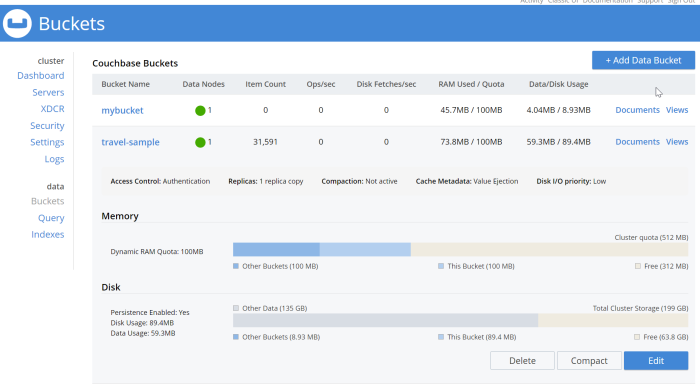 Data Bucket Insights. These have been moved to the right side of the screen. Personally, I think this is a better use of space. (This is an Enterprise Edition feature). Plan and Plan Text options in results. By default, the queries you run will be EXPLAINed, and you can view the output of that in the Plan and Plan Text results. To turn that feature off, click the settings icon next to "Query Editor". 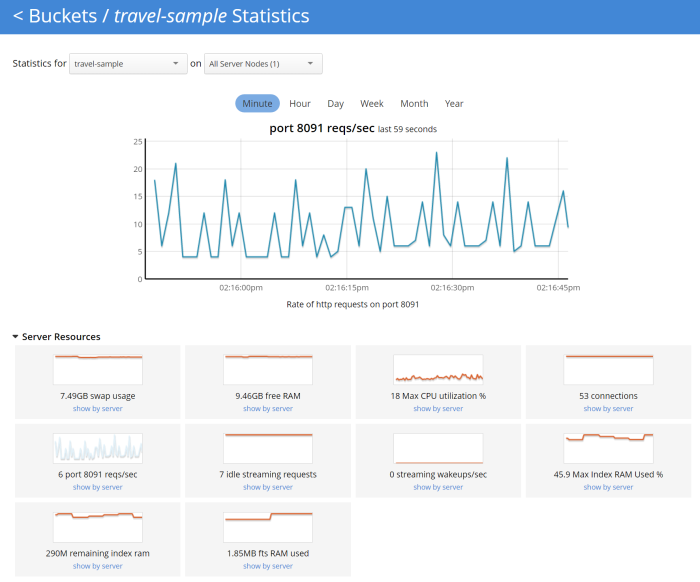 Query Monitor. Notice the "Query Monitor" secondary navigation link at the top. This page shows you information about some of the system catalogs that were added in Couchbase Server 4.5. As a developer, I spend a lot of time in the Buckets section of the UI. The new version of this page isn’t wildly different, but I have found it a little snappier. Click on a row to expand information about the bucket (as well as to expose the Delete/Compact/Edit buttons). One significant area of change is the way that charts and statsitics are shown in the UI. Clicking a bucket name will still bring you to the analytics and information that you’re used to. There aren’t any new charts that I’m aware of, but there have been changes made to improve usabilty of the charts as well as get them to adhere closer to the Material Design philosophy. They also take up the full space of the page, to maximize your view. It’s difficult to demonstrate these changes in a blog post with static images (I may make a video walkthrough in the future), so I definitely recommend that you install the latest version of Couchbase Server 5.x and give them a try. Why did you move my cheese! Hopefully, these UI changes delight you and make your job easier. However, abrupt change can be difficult. This is why there is still an option to view the "Classic UI". Just click this link (at the top right of the page) and you’ll be albe to view the old UI. I don’t know how long the old UI is going to stick around. Figure 17. Use this link to show the old "Classic UI"
To switch back to the new UI from the old UI, just click "New UI". Figure 18. Use this link to go back to the "New UI"
It’s likely that new features will only appear in the new UI. Stay tuned to the Couchbase Blog for information about what’s coming in the new UI in the next developer build. I’ve given you the basic tour, but to really get a feel for the UI, I recommend you download and try it. 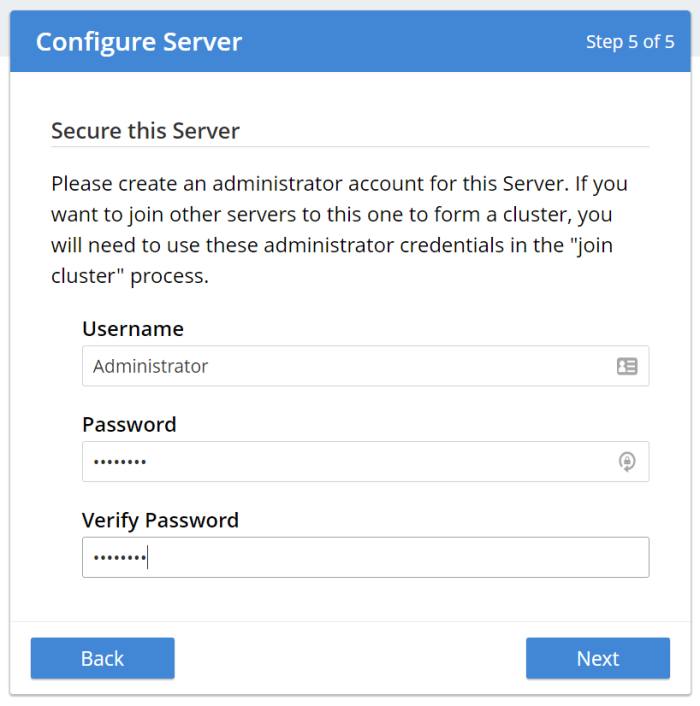 Download Couchbase Server 5.0 today! Bugs: If you find a bug (something that is broken or doesn’t work how you’d expect), please file an issue in our JIRA system at issues.couchbase.com. Or, contact me with a description of the issue. I would be happy to help you or submit the bug for you (my Couchbase handlers give me a candy bar and pat me on the head every time I submit a good bug). Feedback: Let me know what you think. Something you don’t like? Something you really like? Something missing? In some cases, it may be tricky to decide if your feedback is a bug or a suggestion. Use your best judgement, or again, feel free to contact me for help. I want to hear from you. No suggestion is too small! The only stupid question is the one you don’t ask! The best way to contact me is either Twitter @mgroves or email me [email protected]. 10 Mistakes that C# Programmers Make, from Toptal. ...which reminds me of Steve Krug's excellent book, Don't Make Me Think, which is now in its 3rd edition. Reminder that Chad England is still posting in his series on PostSharp. Here's part 2 and part 3. I've used AOP to make threading/async coding more declarative and easier to read. Jonathan George did a blog post on a "fire and forget" asynchronous aspect. For you Game of Life enthusiasts, here's a github blog post from Reginald Braithwaite about using AOP to perform garbage collection in the game of life. That's it for this week--keep sending in those links for next time.